Oils are probably one of my favourite types of product as they can be so versatile with so many different uses. My current obsession is with Avocado Oil which I've been using almost daily for about 2 months now. Like most oils, the best kind to get for maximum benefits is pure, organic, unrefined, cold pressed oil. Avocados are a widely loved superfood, but the oil derived from those avocados doesn't get nearly as much attention as it deserves! Avocado Oil has some fantastic properties which make it particularly beneficial when applied to the skin. It's rich in vitamins E, A & D, as well as potassium and lecithin, and many other nutrients and minerals including magnesium, copper, iron, amino acids and folic acid. It also contains sterolins which have been known to reduce the appearance of scars and age spots, whilst helping to soften and deeply moisturise dry skin. 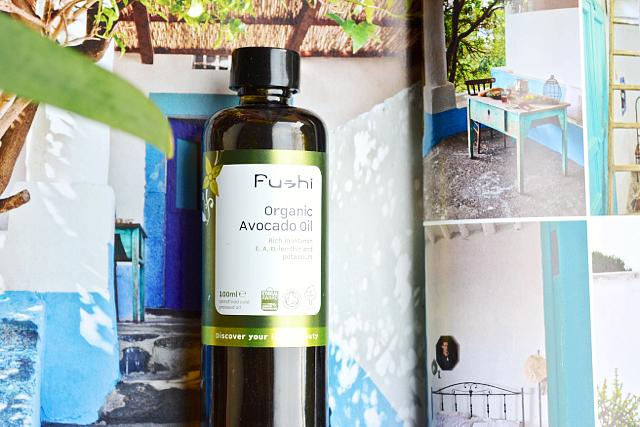 I use Fushi's Organic Avocado Oil* (100ml RRP £9.50), a brand I always go back to as know I can trust their products are very high quality, certified organic, fair trade and more affordable than other brands. The oil from this particular brand is a medium-dark green colour with a subtle, slightly nutty, scent to it. Although it's classed as one of the heavier oils, in my opinion it has the perfect consistency; thin enough to sink into the skin easily, yet also thick enough to help the skin retain moisture. A little most definitely goes a long way! Avocado Oil is particularly great for improving elasticity (by boosting collagen) and moisturising dry skin. Personally I find it really helps reduce any inflammation and speeds up the recovery time for any little occasional eczema outbreaks I get on my hands. As it improves skin elasticity, it can even be used like a body lotion to help prevent stretch marks! It also has a small SPF of around 4-10 and can work really well as a soothing after-sun treatment. I mostly use Avocado Oil as my nighttime face oil (although it is also light enough to use in the daytime under makeup too) and it can also be used as part of the oil cleansing method. My skin has been much clearer and smoother since I started using this oil and some of the small scars on my face have even started to fade. Recently I've been using it as an eye treatment too which I'm sure has been helping to reduce the dark pigmentation under my eyes! Avocado Oil works really well to moisturise and condition the hair as it is one of the few oils that penetrates right in to the hair strands, leaving you with stronger and shinier hair. You can use a few drops through the lengths and ends after washing as a lighter alternative to argan oil, or even leave it on overnight as a hair mask. It's also perfect to use for scalp massage if you're looking for a natural way to help your hair grow. The high level of antioxidants and fatty acids in the oil can help to unclog any blocked hair follicles and stimulate new hair growth. If you like making your own products, Avocado Oil is a great addition to DIY skincare and haircare. My favourite way to mix it is by adding about a teaspoon or so to any homemade face masks for a moisturising boost. With this oil as one of your key ingredients, you can pretty much create any kind of custom product to suit your own needs, such as cleansers, scrubs, body butters, hair masks and conditioners - just a few of many possibilities! Do you use avocado oil as part of your beauty routine? What's your favourite way to use it? I love avacado oil! I personally find it a bit heavy so I use it before bed and it took me a while to get used to the smell. I 100% agree with all the benefits of it- it makes a huge difference to the skin, I can't get enough of it! I love using oils but haven't tried Avocado yet! I love avocado oil, I just started using it a couple of months ago and I think it's a really versatile oil, and an essential for someone who likes oils (like coconut oil and jojoba oil to name just a few).